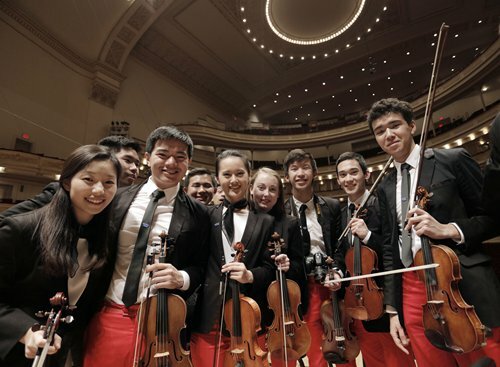 Following their China debut tour in 2015, the National Youth Orchestra of the United States of America (NYO-USA) is set to return to China on July 24, with Taipei as the first stop of their 2018 China tour. With US conductor Michael Tilson Thomas as conductor and French pianist Jean-Yves Thibaudet as guest soloist, the youth orchestra will go on to perform at the Shanghai Symphony Hall on July 27 and at Beijing's National Centre for the Performing Arts two days later. During their 2015 China tour, the NYO-USA performed in cities including Beijing and Shanghai. Formed by Carnegie Hall's Weill Music Institute every summer, the NYO-USA brings together more than 100 of the finest young musicians aged 16 to 19 from across the US. After a rigorous audition process and intensive three-week training residency, the orchestra embarks on a world tour each year. Following China, the teen orchestra will continue their Asia tour in Seoul and Daejeon in South Korea in August.